“Nótt’s themes are learning, knowledge and communication. Her symbols are books, writing utensils and stars. A Teutonic Goddess of the night sky, Nótt generates artistic inspiration and knowledge. She refreshes those suffering from creative blockages and arouses new visions for any endeavor, especially when fall’s declining energies get the best of us. Myths portray Nótt as bearing the silver-studded night sky like a blanket across the dusk. Her chariot bears a frost mare, alluding to the moon. Buchmesse is the world’s largest book fair for the publishing industry, featuring exhibitors from over ninety countries and attended by over two hundred thousand people. In this region of the world, book fairs have been around for over eight hundred years, making Germany one of the centers of world literacy. For writers, today is the perfect time to ask for Nótt’s blessing on your efforts. Submit a poem, article, or manuscript to potential publishers. Write in your journal. Draft a meaningful ritual for improved creativity, and let Nótt’s energy guide your hand. Alternatively, read a favorite poem or book – Nótt’s power is beneath those words – or make a book donation to the local library to honor this Goddess’s contribution to human civilization. “Nótt” by Peter Nicolai Arbo. Timelessmyths.com tells us that “Nott was the daughter of a giant named Norfi or Narfi, but two Eddaic poems called Nott’s father, Norr (not to be confused with Nór), primarily for reasons of alliteration. Krasskova, Galina. Northernpaganism.org, “The Northern Sky: Praising Nott“. Marks, Dominic. Lowchensaustralia.com, “Norse Goddess Names: Nott“. “Sága’s themes are foresight, divination, inspiration, femininity, psychic abilities, kindness and tradition. Her symbols are cups, water and fish. 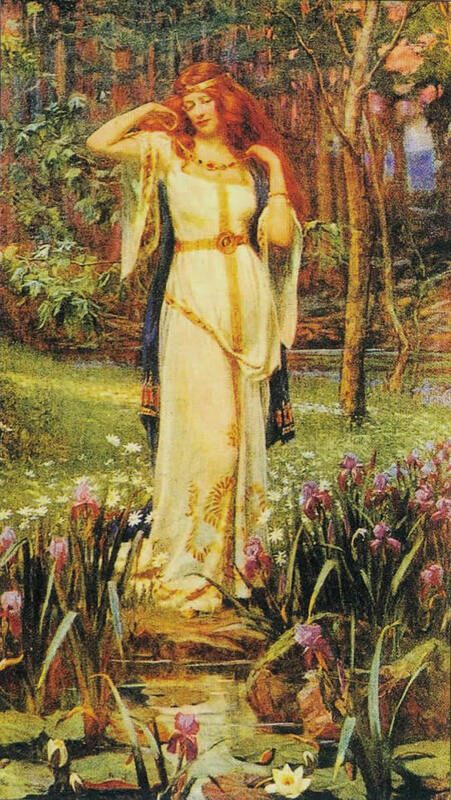 Sága is an attendant of Frigg, is a Scandinavian Goddess whose name means ‘seeress’. Saga is a student of the Universe, ever watchful and ever instructing us about the value of keen observation. She is directly connected with the sign of Pisces, which governs artistic expression, psychic abilities and sensitivity toward others’ needs. In artistic representations, Sage bears a long Viking braid, an emblem of womanhood and honor. According to the Eddas, Sága lives at Sinking Beach, a waterfall, where she offers Her guests a refreshing drink of inspiration from a golden cup. Later, Her name got applied to the sacred heroic texts of the Scandinavian people. Tend your sacred journals today. Write about your path, your feelings, where you see yourself going, and where you’ve been. Saga lives in those words – in your musing, memories and thoughts – guiding them to the paper to inspire you now and in the future. 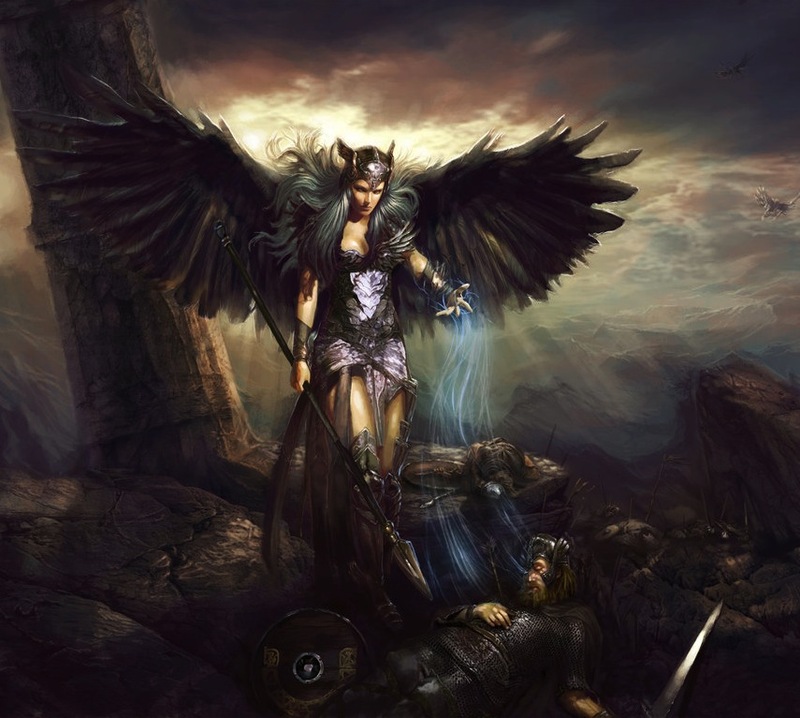 “Sága is one of the twelve major Goddesses, second only to Frigg according to Snorri in Prose Edda. She sits by the stream of memory and drinks from golden chalices at Her grand estate called Sökkvabekkr. Sökkvabekkr means ‘Sinking Beach’ and was a landscape of flowing waterfalls. There She and Oðin drink every day from golden chalices. The liquid is either the waters of memory, or pehaps from the Well of Urðr. 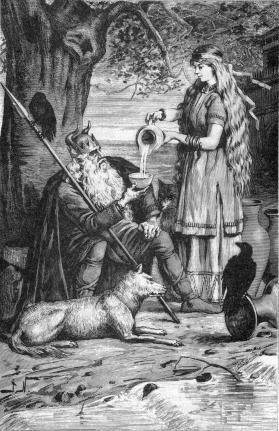 Sága pours Odin a drink in an illustration (1893) by Jenny Nyström. Her name means ‘seeress’ or ‘ominiscience’ and is connected with the Norse word for history – thus, some call Her the Goddess of history. She is often assumed to be the sibyl or seeress who prophesizes Ragnarök. Sága’s name is most likely directly related to the word saga (epic story) which in turn comes from the Old Norse verb segja ‘to say, tell’. It has also been postulated that since Frigg knows everything about the present, and Sága knows all about the past, that Sága is an aspect of Frigg as Memory. Sága’s genealogy is lost in the mists of time, and seems to belong to an older generation than that of the Vanir or Æsir, like Týr. It is thought that She may have been an ancient sea deity akin to a Nerthus/Njörðr or Ægir/Rán combination, which is why sometimes She has been described as the Grandmother of Heimdall (who had nine mothers, the waves). Krasskova, Galina. Exploring the Northern Tradition, “Saga“. “Fulla’s themes are abundance, protection, cycles and magic. Her symbols are gold-colored items and hair. The Teutonic sister of Frigg, Fulla visits us with fulfilment this year, just as her name – which means ‘fullness’ – implies. In legends, Fulla had long golden hair bound by a golden band. She guarded her sister’s enchanted casket of slippers, giving her an additional association as a protectress of magical tools. If the hair ever falls off, re-create the spell. The festival of Up-Hella-Aa has ancient origins and closely resembles Viking funeral rites, except that it’s meant for the season of winter! People on the Shetland Islands gather to watch the burning of a longship. The fire’s golden flame lights the way for spring’s and Fulla’s abundance. It also expels evil spirits. In Germanic mythology, Fulla (Old Norse, possibly “bountiful”) or Volla (Old High German) is Frigg’s handmaiden and messenger. She is a virgin Goddess who is hardly mentioned in lore or in detail. The only detail that I have found is that She has long hair that was worn loose with a golden band adorning her crown. This golden ring was a gift given to her by Nanna and Baldr. Based on her long loose hair and the presence of this golden band, she is believed to be a Goddess of fertility, although she is not one of the Vanir. Fulla is also guardian of Frigg’s little box, which contains all of her jewelry. Fulla was also in charge of protecting Frigg’s golden shoes, and was entrusted with all of Frigg’s secrets. Fulla and Frigg are sisters. Standing straight, unafraid in the rain of spears.” (Galina Krasskova, Exploring the Northern Tradition: A Guide to Gods, Lore, Rites and Celebrations from the Norse, German and Anglo-Saxon Traditions). “Gunnlod – Her themes are creativity, wisdom, health, protection and fertility. Her symbols are mead, poetry, the cauldron or cup and apples. This Teutonic Goddess guards the mead (a honey wine often made with apples) of sagacity and the muse – a refreshment most welcome at the outset of a new year. 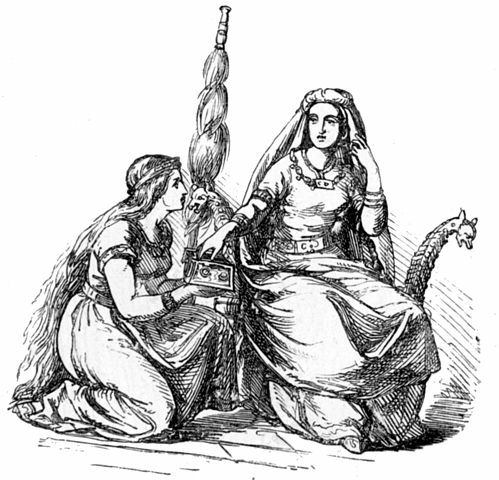 In art, Gunnlod is depicted as a giantess; according to stories about her, she stood vigilantly by the magic cauldron of Odherie until Odin wooed her and stole much of the elixir away. Drink the tea to internalize the magic. If possible, sip it quietly while enjoying a good book of heartening poetry. In Norse mythology, Gunnlöð (Old Norse “war-foam”) is a giantess. Her name could be written as Gunnlod. Click here to read Gunnlod’s tale from Elizabeth Vongisith.